Review by AllTheBestFights.com: 2015-07-17, one sided fight between Brennan Ward and Roger Carroll: we can’t give more than two stars. The Bellator Mw tournament winner (season nine) Brennan Ward entered this fight with a mma record of 10-3-0 (90% finishing rate) and he is ranked as the No.81 welterweight in the world while his opponent, Roger Carroll, has an official record of 16-11-0 (94% submission victory rate – he has never won viako/tko). 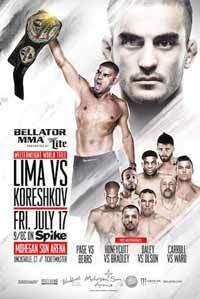 Ward vs Carroll is on the undercard of Douglas Lima vs Andrey Koreshkov – Bellator 140. Watch the video and rate this fight!